There are so many expressions of Chardonnay, it’s difficult to say you don’t like it, although many people do! The Chardonnay rainbow goes from the dry and flinty Chablis from northern Burgundy to the butch oaked bruisers of Australia. In general, there are often apple and pear flavours present in those from cooler climates and the warmer the location, the more tropical the flavours. The six I have chosen here go some way to demonstrating its diversity. 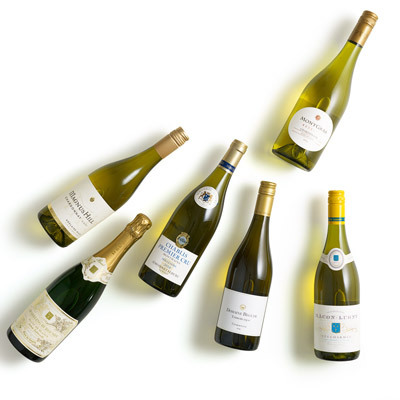 Of course there is a fizz – Chardonnay is used to make many Champagnes and sparkling wines – and there is a diverse selection from the grape’s spiritual home, Burgundy, plus two New World examples. Hopefully you’ll find something you like to match perfectly with these fish recipes. is affordable and has more character than some more well-known Champagnes. It’s creamy and citrussy with biscuity overtones which are not the standard. This is a fantastic value, gentle fizz. This is a good value classic white Burgundy. It’s not often you get to say that! The Mâconnais region of Burgundy offers wines at the cheaper end of the scale. This complex example has tropical fruit flavours and a sunny disposition. It tastes better taken out of the fridge an hour before serving. Chablis is made in the cooler north of Burgundy and is known for incredible purity, freshness and minerality. This Premier Cru is everything you would expect from one of the top Chablis producers: fresh, light and crisp with zing and a steely finish. It goes very well with any shellfish dishes. This has that trademark slatyness combined with honeyed fruit and citrussy notes. In terms of depth, it is a step up from a Chablis, yet still a beautiful, affordable wine. The French terroir on the label is the postcode of where it is made in the cool climate of Limoux. It too makes a great partner to seafood. This Chilean beauty is action packed, brimming with tropical fruit flavours with a seam of freshness. Colchagua Valley is earning a reputation for big white wines and this is no exception. It packs a punch and is powerful enough to not only cope with fish, but mildly spiced food as well. a person, they’d stride down the beach in swimwear, muscles rippling. But this one most definitely has his shirt on. Tropical and peachy with a light frosty edge, it is more restrained, less oaked, and goes particularly well with the fish pie recipe here.